and fashionable. Lignify is the evolution of craftsmanship. and guarantees the finest quality. Offering the finest of British craftsmanship, Lignify use state-of-the-art design technology in our own 19,000 sq ft workshop to turn your plans seamlessly into reality. Whether you’re an architect or interior designer looking for someone to realise your vision, or a contractor seeking to discreetly outsource a furniture build – Lignify’s highly skilled team will work closely with you to meet and exceed your aspirations, delivering excellent results time and again. Lignify custom-make and fit display and retail requirements for all types of outlets. Individually tailored to compliment your corporate identity and selling / display needs, Lignify manufacture bespoke shop fittings, exhibition stands and full fit outs, to pop-up shops and mannequin stands. 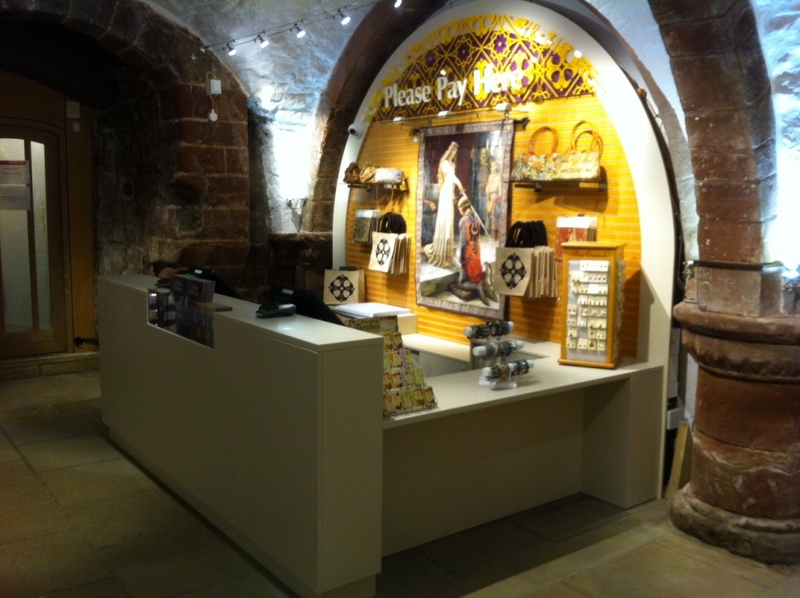 Importantly the fittings can be carried out overnight so your opening times and footfall aren’t affected. Required turnarounds can be especially tight in retail, but with our state of the art machinery we can offer short timescales for even the most challenging or demanding of designs / requirements. 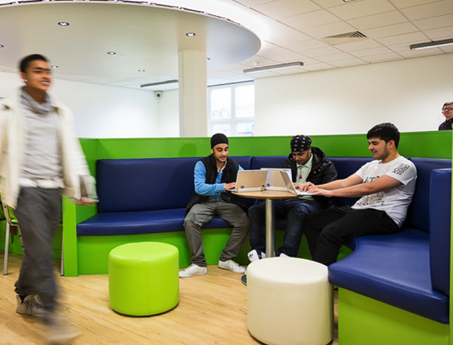 We’ve helped convert old sports halls to contemporary and colourful sixth form common rooms, manufactured and fitted cleverly designed S-shaped seating for school libraries and helped to create a number of modern and inspiring learning environments. Our staff delight in the vibrancy and liveliness that is often central to these educational facility projects. From modern reception desks, bespoke display cabinets for trophies, desks in the shape of spanners (perfect for Design and Technology workshops), to laboratory fit outs; our team’s skills, imagination and state of the art machinery will deliver A-star results every time. Custom desks, media walls, storage walls, hubs for mechanical devices and electrics (including CCTV storage solutions), refreshment units, internal partioning and bespoke freestanding pods – you name it, Lignify can create it. Say goodbye to dull, ordinary office furniture! Lignify will work with your designer, office fit-out or project manager to create a modern working environment that will inspire employees and really make the most of the space available. With a huge range of materials and colours available, the finished product will perfectly represent your corporate brand and identity to staff and customers alike. If you’re a private fitter or contractor looking for a unique, custom made fitting for your Healthcare client, look no further. 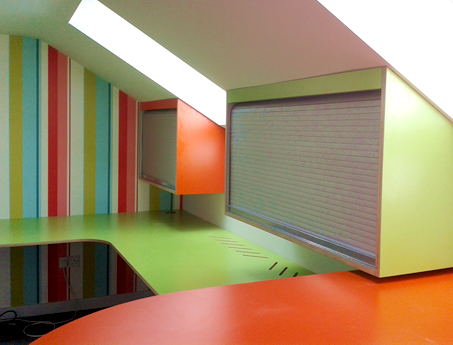 Lignify have a vast amount of experience in working alongside designers to create bespoke pieces to suit a range of spaces including open plan reception areas, laboratories and consultation rooms. We can sculpt solid grade laminates and natural acrylic stone to provide top-quality free formed surfaces – essential when working in clinical, chemical and pharmaceutical environments. 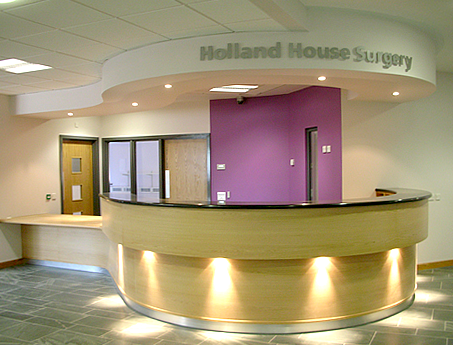 Past clients include Farjo Hair Institute, Holland House Surgery and NHS Bredbury Healthcare Centre (see Portfolio). 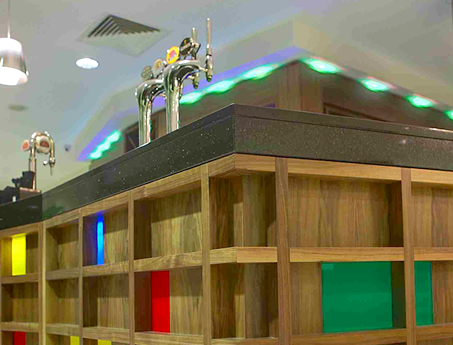 Lignify is experienced in manufacturing and fitting all kinds of leisure and hospitality venues. From a modern Japanese lattice inspired bar at the Ramada Manchester, to a traditional Chinese restaurant in London, our highly skilled team have worked closely with a number of designers and architects to interpret their visions and bring them to life. Lignify’s service goes beyond the manufacturing and fitting. You can also benefit from professional support such as advice on built-in lighting to create the perfect ambience, mirrored furniture to give the illusion of space, and technical knowledge including the accommodation of bar pythons. Central to our success is the quality of our products and the extensive support that Lignify can offer to our clients. 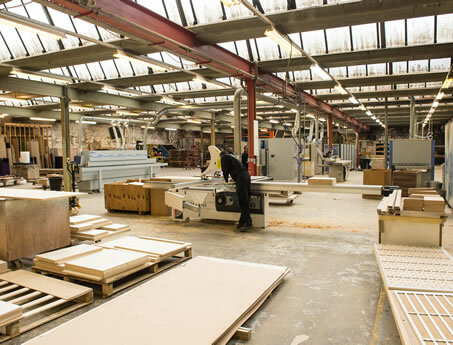 By manufacturing everything in our 19,000 sq ft workshop in Chorley, Lignify has complete quality control and can actively assist and advise you throughout all stages of your project. Our highly skilled staff will provide MDF mock ups of your plans to assist in the concepts and design stages, and can provide samples of suitable materials for your project. Lignify offers expert design and engineering advice, research development, and can work with you to develop value adding solutions for your client. No project is too demanding. Our expert advice, creativity and professionalism will always steer your project in the right direction, resulting in furniture and fittings that are built to impress.